Amongst the deciduous trees flourishing throughout the Canadian landscape are indigenous and introduced fruit trees that thrive in the continental climate regions of southern Canada. These fruit trees bloom in the spring and produce delicious, edible fruit in the summertime. Fresh-picked fruit are loaded with nutrition and can be eaten raw or prepared in tasty dishes. A variety of cherries grow in Canada. Native cherry trees include bitter cherry (Prunus emarginata, pin cherry (Prunus pensylvanica), black cherry (Prunus serotina), western choke cherry (Prunus virginiana var. demissa) and choke cherry (Prunus virginiana var. virginiana). The sweet cherry (Prunus avium) and the sour cherry (Prunus cerasus) are naturalized cherry trees in Canada, as stated by Tree Canada. Black cherry (Prunus serotina) is a native multi-stemmed erect deciduous tree that belongs to the Rosaceae, or rose, family. In Canada, black cherry trees are found in British Columbia, Quebec and Ontario. The tree grows in the spring and summer seasons, reaching up to 80 feet at mature height. 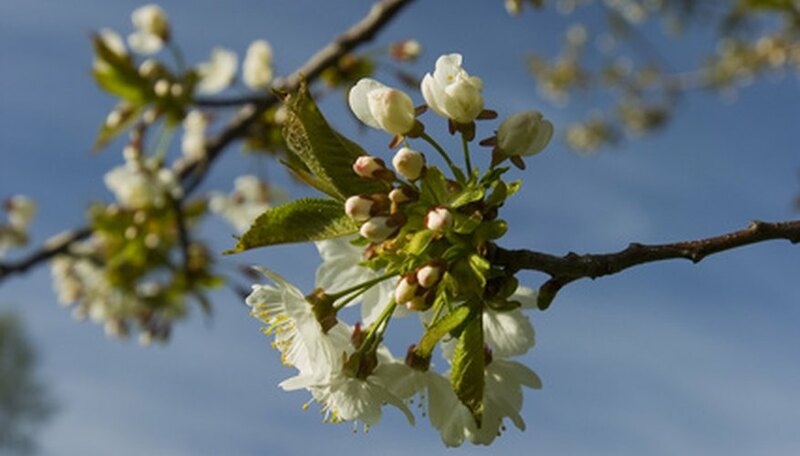 Its small white blossoms bloom in late spring, with its small edible black cherries forming in the summer. Black cherry trees grow in full sun and moist to semi-dry soils. Cornelian-cherry (Cornus mas) is an introduced fruit tree in Canada that belongs to the Cornaceae, or dogwood, family. This erect, single-stem tree grows in the spring and summer, reaching a mature height of up to 26 feet. In the middle of spring, its small yellow flowers bloom, followed by the development of red edible fruit in the spring through summer seasons. Cornelian cherry trees grow in full sun to partial shade and moist to semi-dry soils. Black walnut (Juglans nigra) is a native tree that belongs to the Juglandaceae (walnut or butternut) family. This tree is found in the Manitoba, Ontario and Quebec areas of Canada. The black walnut tree is a single-stem erect tree that grows in the springtime, and towers at 100 feet when mature. The tree enters its blooming phase in the late spring, when its yellow flowers are in bloom. The fruit of the black walnut tree develops in the fall. This tree is shade intolerant and grows in moderately moist soil. The Canadian plum, or Canada plum, (Prunus nigra) is a native fruit tree that belongs to the Rosaceae, or rose, family. It grows in the Manitoba, Ontario and Quebec areas of Canada. This erect, thicket-forming tree grows in the spring, typically up to 30 feet tall. The tree's small white flowers bloom in the spring, and its edible fruit mature in the summer. Downy hawthorn (Crataegus mollis) is a native fruit tree that grows in Quebec and Ontario. It grows in the springtime, reaching up to 30 feet in height, and its small white flowers bloom in early May. Downy hawthorn produces small red berries that mature in August. It grows in full sun and moist soil.